It’s hard to believe we’re already into December! At least for me it is. I have no holiday shopping done, no lists made, no nothing, but I’m excited nonetheless – cookies, carols, trees and decorations, more time with my family and the general good cheer and excitement around the holidays is always invigorating. But because all of this is happening, healthy eating, cooking at home and the like goes right out the window. Never fear, I have some really quick and easy recipes you can whip together to eat well and save time. Like my latest recipe: Asian pork and noodle bowls.It’s warm, it’s hearty and it’s soup at the time of year when soup is always welcome. This particular soup recipe is extra easy because it uses already-cooked pork leftover from my recipe a while ago for honey Dijon pork loin in a slow cooker. If you didn’t make that though, just feel free to chop up some pre-cooked chicken, or pork tenderloin or whatever lean protein you happen to have on hand. This really is a snap to make and it feeds a crowd well. Some people prefer to stir their noodles into the soup at the end, but since I was making a big batch and planning to portion it out over a couple of days’ worth of meals, I kept the noodles separate to keep them from getting too soggy sitting in the soup. When I’m ready to eat it, I just put noodles in the bottom of the bowl and ladle the soup on top then heat the whole thing in the microwave. Ta da! Lunch or dinner’s ready. While the noodles are cooking, heat oil in a large wok and saute the ginger and garlic in the oil for about three minutes. 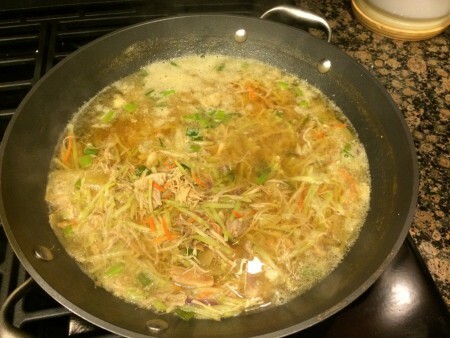 After that, add the broth, pork, broccoli slaw, green onions and soy sauce to the wok. Bring this soup to a boil, reduce the heat and simmer for 5 minutes. At this point, turn off the heat for the wok, divide the spaghetti evenly among six bowls and ladle the soup mixture on top. Now you’re ready to eat with fork, spoon, chopsticks, etc. P.S. Have napkins handy – it can get a little messy. Here’s the pork soup in the wok. I added the noodles in the bowl to keep them from getting soggy. Here’s the Asian pork and noodle soup in a bowl. It’s delicious and filling. 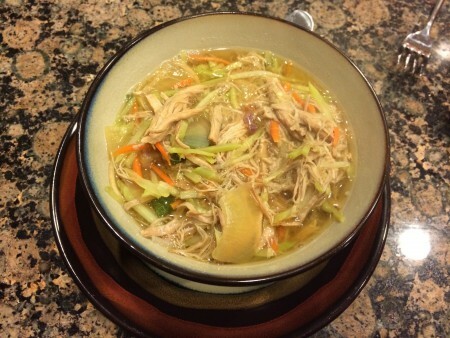 This entry was posted in Entrees, Recipes and tagged Asian, Asian Noodle Soup, Asian Pork and Noodle Soup, Asian Pork Soup, Asian Soup, Entrees, Noodle Soup, Noodles, Pork, Pork Soup, Recipes, Soup on December 3, 2014 by Paige N.. I do the same with noodles. Best to let everyone choose how much noodles they want anyway. I love lots of noodles, my husband prefers less. Good thought! I just did it to keep the noodles from getting soggy, but you’re right, some people want more than others.